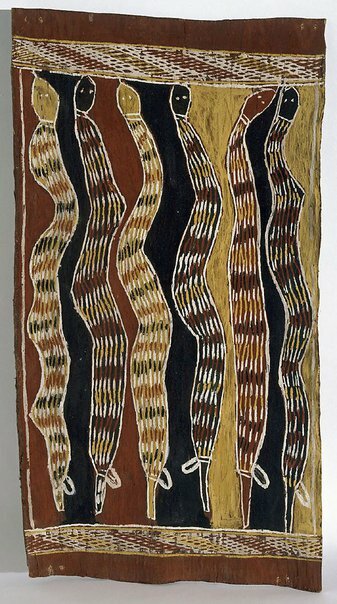 In 'Därrpa (king brown snakes) – Djambarrpuyngu rain story' c1950s Binyinyuwuy refers to his own identity as a man of the Därrpa, or king brown snake people. The därrpa extend skyward, in an attempt to pierce the clouds and initiate rain. The somewhat crude execution of this work is at odds with the majority of Binyinyuwuy’s painting, which is of refined elegance. This may indicate that it is among his earlier works, as it is similar in style to 'Baṉumbirr (morning star)' 1948. Cara Pinchbeck, Art from Milingimbi , Binyinyuwuy’, pg. 44-59, Sydney, 2016, 51 (colour illus. ), 140.